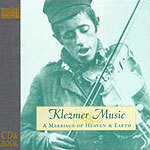 CD review: "Klezmer Music: A Marriage of Heaven & Earth"
A half-century after the Yiddish-speaking community was for all intents and purposes destroyed in Eastern Europe, the music of that community is enjoying a revival across the globe. For those unacquainted with it, klezmer is a kind of European blues. While structurally more complex, it has the modes and moods of blues  a world-weary humor born of suffering and persecution. With most klezmer combos built around the clarinet, violin and/or accordion, klezmer also has a blues-like sadness to it  although, as with the blues, not all klezmer is sad. What all klezmer is, though, is danceable! And it is a living music. The leading practitioners of klezmer today  bands such as The Klezmatics and Brave Old World  certainly aren't museum combos a la Dixieland jazz bands with straw hats and candy-striped jackets. Klezmer is a living music, changing, growing, evolving. It has found a modern constituency composed of Jews and goyim alike, a constituency that demands a klezmer relevant to our times while reamining faithful to the past. This book/CD combo is beautifully illustrated, containing both a fine history of the music and lots of interviews with contemporary musicians. Good stuff, all.